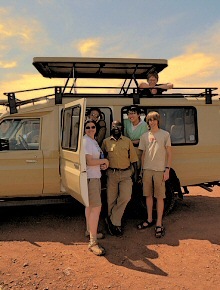 Day 1: Transfer to Murchison Falls national park. Luxury; Paraa safari lodge/ Nile Safari camp/ Pakuba safari lodge/ Chobe safari lodge. Mid range: Sambiya River lodge/ Budongo Eco- lodge/ Murchison river lodge/ Fort Murchison lodge. Day 2: game drive and Launch cruise. After your break fast in the morning, you will then drive to the northern section of the park for the early morning game drive. You will drive across the savanna, along Lake Albert Delta to search for wildlife like elephants, Lions, hippos, giraffes, buffaloes, there will be warthogs, hyenas, so many savannah bird species. Before midday, you will be through and return to the lodge to wait for your lunch. In the afternoon, after your lunch, you will go for a 2 hour launch cruise along the Victoria Nile and this takes up to the bottom of the falls. During this boat ride, you can expect to see animals like the crocodiles, hippos, buffaloes, among along the Nile river Banks and in the water. You can also opt to hike up to the top of the falls which will be at an extra cost or return with the boat to where you started from and then drive back to your lodge. On this day, you will drive back to Kampala immediately after your breakfast; you will have a lunch en-route and just proceed to Jinja which is towards the Eastern direction. There are a number of plantations the you will find along the way, Mabira forest, the biggest natural forest that Uganda has and you can go have a nature walk in this forest if you are interested in this nature walk. There is variety vegetation cover, primates like monkey and lots of bird species in this forest that may interest you if you decide to take the walk. Later, you will continue to Jinja and will be there later in the evening hours and so just head to your lodge where you will spend a night as well as the meals at either. Day 4; Day in Jinja. 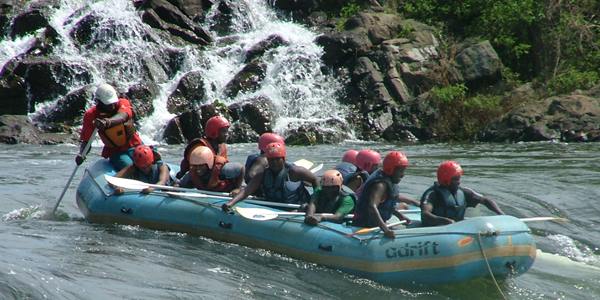 After your breakfast, you may opt to do White water-rafting along the Nile, kayaking, quad biking or horse riding. White water rafting is an exciting exercise which is often many people’s choice even if it is for the very first time as it does not require any experience. All training can be done there one you first day. After breakfast, you can go visit the Ssezibwa falls and from there, you will have lunch and after lunch drive back to Kampala so that you can catch your flight if you are departing on that very day and if not, then the guide will drop you at the hotel of your choice. This marks the end your safari with us.